Whenever Exalted Angel deals damage, you gain that much life. By tradition, when we need help with a deck, we create a new "deck" in our profile. We itemize our cards so it's easier for players unfamiliar to hover over and know what they do. And when linking them, We use double brackets. Remember that deck building skill increases with blood alcohol content (but only if you're 21, otherwise stay away from the stuff). Doubled by Rhox Faithmender 2.0 = 32 life. Doubled by Rhox Faithmender 2.0 = 72 life. Partial Total of +13 life. 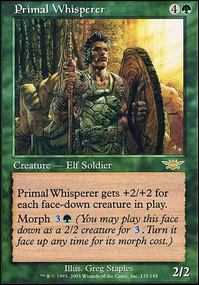 One of the biggest lessons I learned since I first started playing Commander/EDH, is the first thing you need to ask yourself when choosing a commander is "How can I exploit this commander?" 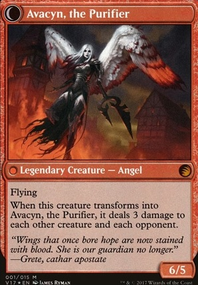 Avacyn, Angel of Hope is a powerful card on its own, but it can turn the card Armageddon, from destroy all lands, to destroy all lands but your own. It's things like that that make a deck strong. 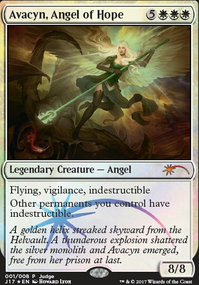 Lyra in particular is strong with a card like Exalted Angel. The reason why is because the wording of the card means it technically has lifelink, without counting as lifelink. 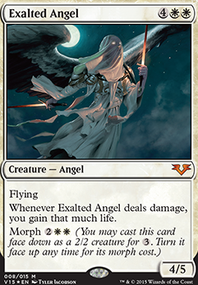 So if Lyra is out, the Exalted Angel gains twice the life of damage done. I learned this playing Essence Sliver and Syphon Sliver, I like slivers. Speaking of which, you should make full use of your commander's abilities and have more angels. 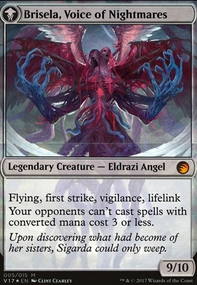 You have quite a few removal spells, it would be a good idea to combine removal and control with angel creatures ie: Sunblast Angel, Angel of Deliverance, or the aforementioned Angel of the Dire Hour. Magic is a game of making the most use out of each card you have. Linvala, Keeper of Silence is also a good card to have. It can shut down entire decks, without interfering with your own (Seeing as how angels rarely have activated abilities). If you want to see more examples of this stuff you can check out my own personal mono-white deck: Blood for Sword, Sword for Blood or any of my other decks. I hope this helps. I think building a deck to honor your mother like this is really awesome :) I wish you the best on your journeys to come. definitely bring in Enlightened Tutor. This card can search up your infinite-combo pieces Rest in Peace or Helm of Obedience, or both Altars with Reveillark-Karmic Guide-combo or other useful stuff. Tutors are gold in EDH. Also definitely consider Recruiter of the Guard. He synergizes with all your flicker/etb-effects, can search up i.e. Karmic Guide or Knight-Captain of Eos or Ranger of Eos or other stuff and is a soldier, which again synergizes with Knight-Captain of Eos & Captain of the Watch. Since you have very strong etbs also maybe consider Eerie Interlude against mass removals and for value. You should play more lands. 38 at least and a little more artifact ramp cause your commander is expensive. My draw hands were mostly mana heavy. With this you can play your 4-5 mana stuff earlier. Definitely bring in more card draw. Big suggestion is Skullclamp here. Works really well with your 1/1 tokens! Some cards I recommend to cut: Angel of Flight Alabaster you only have 1 Spirit and that's Karmic Guide. Exalted Angel is slow and does not enough for it's mana in my opinion. Consider Archangel of Thune to pump your whole team, maybe and more budget Victory's Herald for evasion. 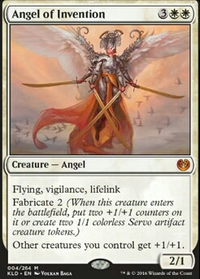 Exquisite Archangel is in my opinion better suited in combo-decks which drain themselves or something like this. Ageless Entity is just a big fat boy, no evasion, no +1/+1 counter synergy. He doesn't do enough for 5 mana. Baneslayer Angel is kinda in the same boat. Gains some life, but not super resilient, and not a super fast clock. Exalted Angel falls under the same category of medium beaters. Probably Gisela, the Broken Blade too? All 3 soul sisters should go, they're pure dedicated life gain with no other upside in a deck that already gains plenty of life. They might be good enough for Karlov that gets immediate value off of repeated small incremental life gain, but not for you. Sangromancer is pure dedicated life gain on a medium body. I don't think much of it but it can situationally gain crazy life. I'd cut it but I can see the argument for it. Siege Rhino maaaaaaaybe? If you intend to go full on tempo agro? Doesn't feel like an amazing strategy tho, and the deck feels more grindy than agro. Quiet Disrepair this is a comically bad way to get rid of a problem artifact or enchantment, and some of those faster, more certain methods gain life anyway. Leyline of Vitality is basically just a soul sister. Maybe trim a few pieces of your more mediocre spot removal? Molder sticks out as pretty bad. 6 field sweeps seems a little high considering you kind of want your field to stick, and your recursion isn't super strong. Day of Judgment at least seems like it could go. You got like 10 ways to kill artifacts/enchantments, so Fracturing Gust might be overkill. Beebles, thanks for taking a serious look at the deck. I appreciate the feedback, since this is a work in progress, as evidenced by the huge comment thread and the various updates. Sphere of Safety - Enchantments are one of the things that just seem to stick around more than other permanents. There are only 8, but I end up collecting them, and three of my most tutored for cards are enchantments, so they often come out. There once was a few more enchantments, and I am not sure of my threshold below which I would get rid of it, but you are right, I haven't really considered removing it. I was just recently thinking that I would put more Ghostly Prison type cards in if I could, and Sphere of Safety is just an overcosted and typically weak version of Ghostly Prison. Academy Rector would potentially fit the bill, in that I would be able to search for that Ghostly Prison, but Aurification may be counter to my strategy. Unlike No Mercy, Aurification leaves them with defense, and I dont want other players to have defense, if possible. I have considered Lightmine Field, but that is only worthwhile against swarm attacks. I will keep in mind that replacing Sphere of Safety with Academy Rector may actually work out nicely, and would lower my curve ever so slightly, and would even be another creature for my recently added Worship. I appreciate the suggestion. Boros Fury-Shield - This was a card that I did consider early, and have not returned to it since, for no really great reason. I excluded it early for a few simple reasons. It is a fog that only affects the damage done by a single attacking or blocking creature. This seriously limits its ability as a fog. Every other fog I added could stop all damage aside from Deflecting Palm, and the ability to redirect any damage source makes it far superior. The ability to redirect damage is essentially shared by every other fog in my list aside from Dawn Charm, and the other modes of Dawn Charm make up for this. It sort of behaves like a highly conditional Backlash or Delirium, and maybe I should think of it that way. In that case, it actually could fill a role in the deck. Thank you for the reminder. I may consider trialling it as another conditional copy of Backlash or Delirium. Lotus Vale and Scorched Ruins - These cards are there for much more than as a way to mitigate the damage from Price of Progress. They work somewhat subtly in the deck, and the real reason has to do with another synergy that you did not mention as well as a psychological reason. The risk has been mitigated in my meta by an overaggressive (others said abuse) of targeted land destruction by myself. After a fun bout with a Life from the Loam deck that abused Strip Mine and its various friends, when I tried playing Strip Mine in a few other decks, including this one, and there were enough complaints that we agreed that land destruction is not fun, and we basically all agreed to take it out of our decks. No one enjoys non-basic hate or color specific hate, either, so no one plays them. I understand that this is a very specific meta that I play in, but this mitigates the risk, and there is little risk in playing these lands at this point. The value of these cards has to do with keeping my land count low. This helps with Acidic Soil and Price of Progress, but also makes Tithe, Gift of Estates, and Weathered Wayfarer stay active. These three cards draw me a ton of cards, which I can pitch to Key to the City or Solitary Confinement. These three cards are a decent amount of my non-Monarch card draw. Solitary Confinement is my most tutored card, and extra cards in hand are really valuable. Trimming my lands with Lotus Vale and Scorched Ruins, as well as the Ravnica Karoos and Gemstone Mine all lead to lower land counts, and ensures these synergies with both my offense and my card draw, while leaving me with the same potential mana as everyone else at the table. This is where it gets subtle and tricky. When people look around the table for threats, number of permanents plays into threat assessment. Appearing to have fewer lands makes me appear as less of a threat. It is super easy to overlook the fact that I can often get 7+ mana from 4 lands. Scorched Ruins is actually Ramp, and is a little like a Sol Ring in disguise. When people actually count, they are not fooled, but it is surprising how often people just glance at your lands, unless they are looking for responses to their plays. Not playing Blue means I get less scrutiny than some, and this lowers my threat level. Altogether, the cards in the deck have many synergies as well as subtle psychological effects that the whole package together is much more powerful than the basics that could replace them. As far as reactivity goes, I would break it down into two categories: Instants, and interactive permanents. While instants make up the bulk of the deck, interactive permanents are super interesting. I have 22 instants, 17 of which are tutorable with Sunforger. You dont need that many, even as a Sunforger package. As a toolbox, Sunforger packages are usually 10+ cards. Less than that is probably underpowering it. Aside from that, I have never had a goal in mind for reactivity. I thought about how I could lose, and set about trying to overcome those conditions, hopefully in a way that wins me the game. I also thought about what sorts of game states are common, and went about trying to punish those game states. Finally, I thought about how to create exciting game state swings in ways that would not make me a global target. Some of this lead to some Mardu goodstuff, but many of these cards are somewhat uncommon. What evolved from this thought process is the deck you see. It now has 22 instants, 18 of which are truly interactive and reactive, as well as a couple of interactive lands, a couple of interactive artifacts, a couple of interactive creatures, and an interesting interactive enchantment. In essence, I have no threshold, and would not consider the underlying philosophy of deck construction used for this deck to be particularly interested in thresholds. I like the idea of Electropotence, and agree that the synergy with Lifelink and Deathtouch would be great, especially for Assassin and Snake tokens. 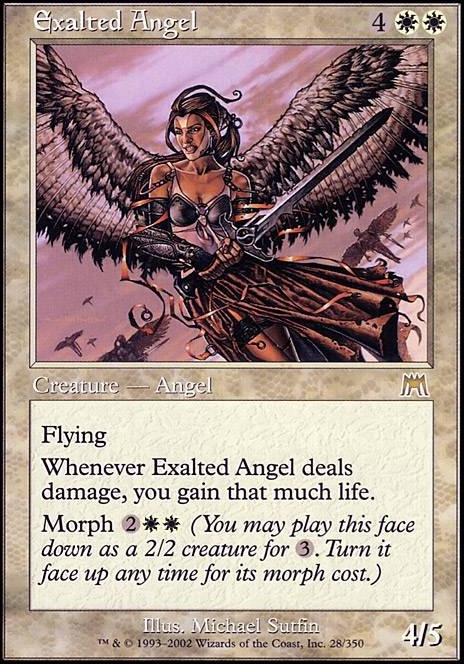 I think that Warstorm Surge, Baneslayer Angel, and Exalted Angel are too mana intensive for my tastes. Thanks for the suggestion of Electropotence, I may trial it, and it may prompt me to add more Deathtouch creatures again. Ogre Slumlord with Electropotence is a wrath and token bomb all at once. Interesting. Thank you for the suggestions, and the discussion. It always helps. You have given me a few cards to consider, or even just reconsider, as the case many be. These kinds of discussions have been what has lead to this decks long evolution to what it is now, and will continue to evolve it. Thanks.